Standards play an important role in ensuring quality solutions for governments and businesses around the world. However did you know that when it comes to OGC standards you can request certified compliance for those solutions? An example where this used is the standards recommended by the Geospatial Intelligence (GEOINT) Standards Working Group in the United States, which includes standards developed by the Open Geospatial Consortium (OGC). The OGC has certified hundreds of products and maintains an online database with detailed information about the products that implement and comply with OGC standards. 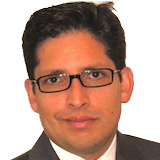 Dr. Luis Bermudez is the Executive Director of Compliance and E-Learning of the Open Geospatial Consortium, the world leader organization focused on developing open geospatial standards that "geo-enable" the Web, wireless and location-based services and mainstream IT.